The SLC43 AMG is the perfect daily driven roadster! Daily driver and roadster rarely fits into the same sentence unless you are a complete car enthusiast. That’s because roadsters traditionally trade comfort for the ride of a lifetime. Some classic roadsters such as the Jaguar XK120 roadster didn’t even have rollup windows! And if you think that is unpleasant, the Porsche 550 Spyder didn’t even have a top! Those lavish features were meant for “convertibles.” Modern roadsters have power windows and most have automatic cloth top. Mercedes-Benz, staying true to the motto “The best or nothing,” has brought comfort back to the roadster – first with the SLK in 1996 and now again, 20 years later, with the SLC. The car’s best feature is its retractable automatic hardtop. It allows the SLC to transform within seconds from a roadster to a sporty coupe. You literally get the best of both worlds! There is no more saying that roadsters are too noisy on the highway or that they are too hot during the summer (or too cold during the winter for my northern friends). Some might argue that modern rag tops are just as well insulated as hard top convertibles – they might be – but I don’t think so. When I am driving with the top up on a rag top, I am constantly wishing in the back of my mind that the weather was nice enough to put the top down. When I drove the Mercedes SLC43 AMG with the top up, I kept thinking to myself how great the coupe experience is. Also rag top roadsters such as the Porsche Boxster, Jaguar F-Type, and Audi TT don’t look nearly as good with the top up as the Mercedes SLC43 AMG does. Now there are a couple drawbacks to having a hardtop convertible: 1) It weighs more because of the mechanical mechanisms. 2) You typically have less trunk space. With that being said, this is your daily driver and not a track car, so weight is less of an issue. In terms of trunk space, the SLC43 AMG does have less room than the 718 Porsche Boxster (with its two trunks), but I was able to fit more groceries in my SLC tester car than I was in the Jaguar F-Type convertible I tested last year. 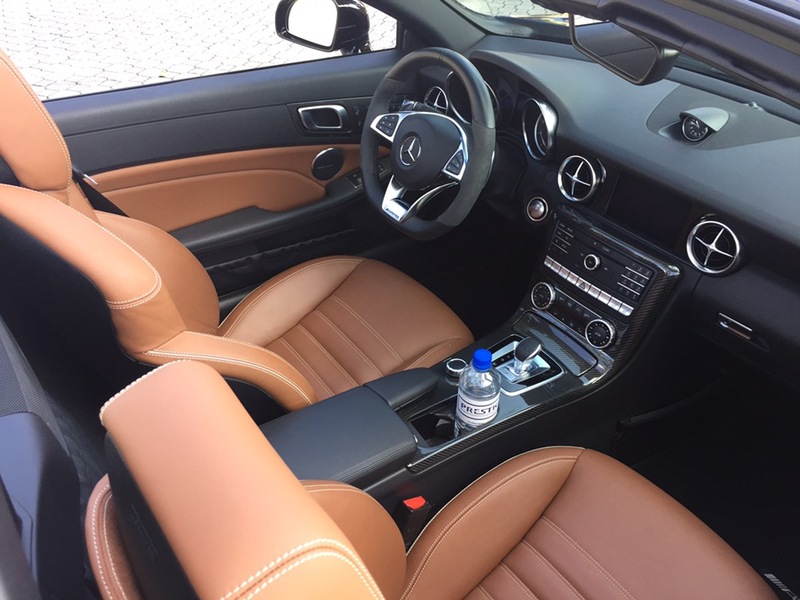 The interior quality has also been kicked up a notch with the SLC43 AMG versus the competition. I instantly fell in love with its saddle brown leather interior with white stitching. As part of the AMG variation, the SLC I tested also had a semi-alcanta flat bottom steering wheel to accentuate the performance aspects of the vehicle. With a 362hp 3.0L V6 biturbo engine and a 9-speed gearbox, the Mercedes-Benz SLC43 AMG is no slouch. It will do zero-to-sixty in less than 5 seconds. The rear-wheel-drive SLC43 AMG also handles surprisingly well thanks to a well tuned AMG Sport suspension. I specific rear-wheel-drive because one of its unnamed German competitors (the Audi TT) has a front-wheel-drive bias for its all-wheel-drive system. With a performance oriented mindset, luxury accommodations, and the benefit of having both a convertible and coupe, the Mercedes-Benz SLC is my pick for the best daily driven roadster… The top seals the deal! You can find more information about the Mercedes-Benz SLC43 AMG by visiting your local deal or by clicking here to visit the Mercedes-Benz website.